Evangelism has always been difficult. Gone are the days when even nonChristians generally understood what Christianity taught. Nowadays, even many professing-Christians struggle to articulate the essentials of Christian theology. Because we can no longer assume a general awareness of Christian thinking, evangelism will continue to require us to teach basic theological truths before we can be assured that people know enough to truly become Christians. Here are three truths every Christian should know and be able to clearly explain to others. God is Holy and Sovereign (Isaiah 6:1-5). He is infinitely bigger than you could ever imagine. God is the Creator (Gen. 1). He made everything that exists… including you. Not only did he make you, but he made you in his own image! Whether you recognize it or not, you belong to God. God is the Judge (Rev. 20:11-15). It doesn’t take much more than a bit of honest humility to see that there’s something seriously broken in the world and in our own soul. We will give account. 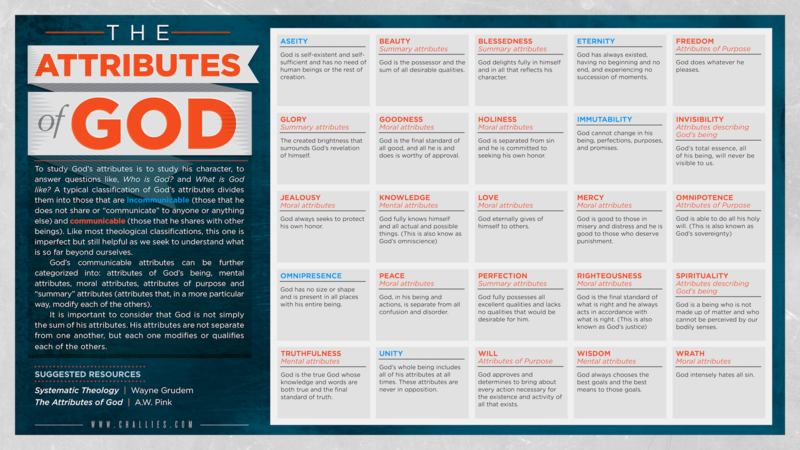 Obviously, there’s more that could be said here about who God is and what He’s like… you can go HERE for a chart that lists out the Attributes of God and will help you explore this further. God never gave up on us (Gen. 3:15; Isaiah 53). Even from the moment of humanity’s first sin he has always left a message of hope for us. He sent prophets to tell us there would be a day when we would be freed the judgment we deserve and reconciled to God. God did the unthinkable – He became one of us (John 1:14). Think about it, God the Son (the second Person of the Trinity) really, historically, physically became a baby boy who ate, slept, and did other things babies do… except he never sinned. God died in order that you might live (John 3:16-17). Yes, I wrote it that way on purpose – for that is who Jesus is. He took your punishment, your judgment, your wrath, your sin upon himself so that you could be set free. That’s love! God has saved you (Rom. 8:1). This is probably the simplest way to put it. God is calling you to be secure (Rom. 8:37-39). Life is unpredictable and can get turned upside-down in a moment. Because of Who God Is and What God Has Done, you can stand secure on the unchanging God. God is calling you to live by faith (James 2:18-26). This might sound simple (and it is simple, in some ways), but it certainly isn’t easy. You can’t live by faith if you never do anything beyond your ability. Will you really trust God, or just talk about how trustworthy he is? God is calling you to be a light (Matt. 5:14-16). A candle doesn’t need to be taught how to give off light and heat, it just needs to be lit. When you submit yourself to God, He will change you day by day. The more your love for God and faithfulness to him grows, the more brightly you will shine. (note: This isn’t something you accomplish by trying to do it, it’s a byproduct of savoring the realities of knowing #1 and #2 above). These are all basic and essential truths that every Christian should be able to articulate as they discuss their faith with others. Write these out. Read the Bible verses. Discuss them with friends or in your small group. Become familiar with these three truths so well that you can clearly explain them in a way that is natural and biblical. This will equip you to preach both to yourself (during seasons of doubt or temptation or dryness) and to others. ← Why Can’t God Overlook Sin? I like how these are all theocentric. Amen!